1/31/97--BLOCK CLUB/UPPER MT. FIRE--DAN CAPPELLAZZO PHOTO--(LTOR)CHARLES W. KRAFT, CHAIR., WANDA CUTINI, BLOCK CAPT. COOR, SAM GELFAND, BLOCK CAPT., SIMON SHAKARJIAN, BLOCK CAPT. 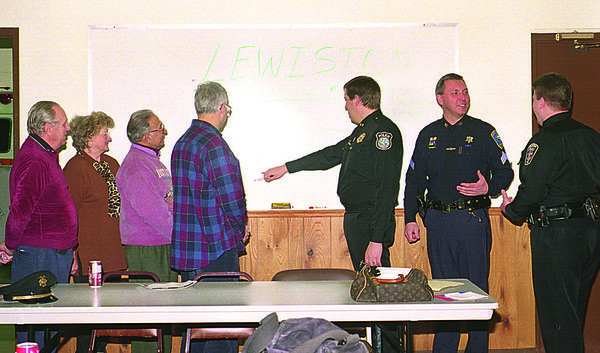 SPEAK WITH CHIEF LEWISTON RON WINKLEY, SGT ROSS ANNABLE, TOWN NIAGARA, AND LEWISTON FRANK DISPENZA AT UPPER MTN. FIRE HALL.